JES Co England White Vinyl Covered Wire Plate Hanger Diff Sizes 3.5" up to 16"
Due to the light and screen difference, the item's color may be slightly different from the pictures. Material:Stainless Steel. Model:V type. We will reply you ASAP. They are from importers from China and from India. I will give you the best information I can. We do our best to identify the stone beads to the best of our knowledge. Clear acrylic stand for display of shoes. Material: Acrylic. Shoe shown in picture is NOT included. Due to the difference between different monitors, the picture may not reflect the actual color of the item. Gift Idea! Color rustic black. 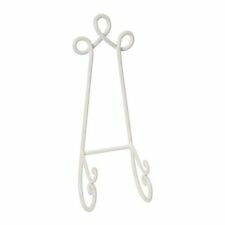 High quality cast iron coat hanger artisanal made. Thickness iron about 5mm. Made locally in France. Total weight about 8.1lbs/ 3.7kg! Polyester Blue and white porcelain pattern Sofa Decor Pillow Case Cushion Cover. This Slippers rack set is right for space saving and well organized your shoes. It is suitable for installed on the wall, door, glass windows, even closet and etc. Plate hanger discs are attached to the back of the plate or any item you hang. 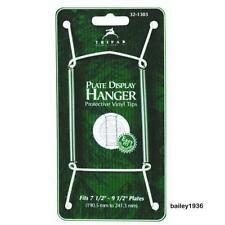 Our plate hangers will not detract from your decorative item. These English Plate Hangers have been tested and proven for generations. Trending at C $6.62eBay determines this price through a machine-learned model of the product's sale prices within the last 90 days. Display your plate collection in safety and style with this set of attractive black plastic holders. Decorative plate collections deserve the right display racks. There are many available options, ensuring that collectors can find a display style that suits their collection. From wall-mounted plate hangers to single plate holders, these racks are a great way to organize and display plates. What types of plate holders are available? 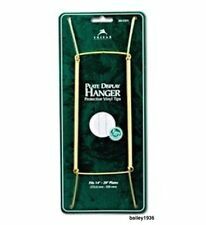 Wall-mounted plate hangers: People who don't have adequate counter space may want to invest in wall-mounted plate hangers, which allow them to hang their plates on the wall. Collectors can choose between individual hangers, which are designed to hold one plate, and multi-plate styles, which are designed to hold as many as eight plates. Larger plate hangers come in vertical and horizontal options. While some styles are decorative, with scrolls or embellishments, others are invisible, and use adhesive discs to hang plates. Plate stands: Many plate stands are designed to display a single decorative dish. They can be placed on tables or shelves, and they give collectors the freedom to arrange their plates as they wish. Plate shelves: Some display shelves are specially designed for decorative plates. Most of these shelves are wall-mounted. Plate racks: Plate racks range from plastic storage units designed to speed up drying to decorative racks made to show off favourite dinner plates. These racks aren't usually made to showcase collectibles, but they are often a chic way to store everyday dishes. Some racks are adjustable, accordion-style, and can be placed in kitchen cabinets as a means of organizing dish collections. What are plate holders made of? Plastic: Many plate racks are made of plastic, as this allows plates to dry more quickly. Some plate stands are made of plastic as well, especially if the stand itself is not meant to be visible. 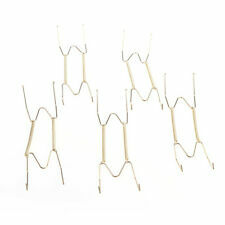 Metal: Many hangers are made of metal wire, like wrought iron or brass. They often feature embellishments like loops, scrolls, and Victorian flourishes. Metal plate holders range in size from individual holders to multi-plate wall mounted hangers. Wood: Many hanging shelving units are made of wood. 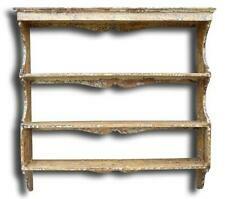 These horizontal shelves are a shabby chic solution to large plate collections. Plate racks are often made out of wood, giving users a durable place to stack dishes in between uses. What home decor styles are plate holders available in? Plate holders are available in every conceivable home decor styles. People who prefer contemporary styles can select unadorned metal plate holders. Plate holders with decorative loops and flourishes are great for those who prefer classic decor styles.